Having guild-themed charms in a Ravnica-related set is such an obvious move, it really makes you wonder why they didn't do it the first time around. If I see a thousand Magic sets, I doubt I will ever see any decision more confusing than that one. But now we have them, and very soon we'll be able to play with the complete set. Often, charms bring three effects that wouldn't "fill" a complete card on their own, but when you put them together you get the benefit of flexibility and of not having to "spend" a card on such small effects. However, when a charm goes to the next level and has three effects that are sometimes or always worth a card on their own, as Boros Charm does, you have a real hit. I especially like how all three modes show you explicitly what the Boros strategy is all about, as they either end a game or keep you in one. The only question is whether the other Gatecrash guilds charms are the same sort of thing (spoiler alert: they are). Today's card of the day is Boros Charm which costs one Red and one White for one of three effects. The first effect of dealing four damage is decent at the two mana cost, but outside of a finishing blow or to respond to a discard it should be avoided in favor of the other effects. The making all of your permanents indestructible until end of turn is an incredible combination with most forms of mass removal and works well in response to an opponent's attacks or removal effects. The third effect can also be used as a finisher, with Lifelink and other combat abilities, or to kill a larger threat which allows some flexibility if not the raw power of the second option. Overall this is a versatile and combo friendly card that belongs in every Red/White deck as it has benefits in nearly any situation, whether offensive or defensive capabilities are needed it can provide something valuable. In Limited this is a great second and third pick for Booster and automatic inclusion for Sealed that can strengthen any Boros guild deck. Double Strike on one of the larger creatures like Spark Trooper, Foundry Champion, or Aurelia with a copy of the common Gruul's Scorchwalker in hand can easily be a one turn kill. The protection effect is still useful here, though the direct damage or Double Strike are far more likely to be stronger uses of the card than in Constructed formats. Welcome to Charm week here at Pojo.com's card of the day section! We begin Charm week by looking at the Boros Charm. 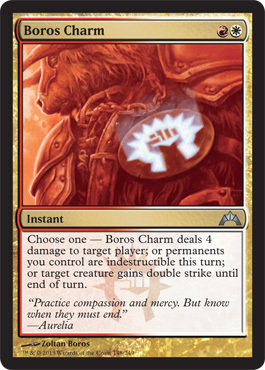 Boros Charm, like all of the other Charms, is an uncommon instant that costs one each of the Guild colors, for Boros, that is one red and one white mana. Again, like all the Charms, there are three abilities to choose from once cast. The Boros Charms abilities are: Boros Charm deals 4 damage to target player; or permanents you control are indestructible this turn; or target creature gains double strike until the end of turn. Boros Charm is hands down my favorite Charm. Ever. I absolutely LOVE the abilities that they gave the Boros Charm. Two mana for four damage to your opponent could very well be the final blow needed to finish off an opponent. The second ability could be a timely answer for a Supreme Verdict. Or if your opponent launches an offensive and you block but don't want to lose any creatures. Or your opponents are surprised during your own all out assault. But for me the last ability is what truly makes this Charm my favorite. Instant speed Double Strike on a creature you control. That is just so effective. Assault Strobe was nice, but at sorcery speed, just not a good play. Double Cleave was one of my favorite cards, and this is even better. All it takes is one decent sized creature, and it could be game over. Boros Charm is definitely my favorite Charm, and quickly becoming one of my favorite cards from Gatecrash.